Objetivo: determinar la utilidad predictiva de la escala rápida de emergencias (REMS) en términos de mortalidad intrahospitalaria y estancia de pacientes adultos sean quirúrgicos o no que ingresan al servicio de urgencias del Hospital de San José de Bogotá. Método: estudio analítico, retrospectivo de pacientes que ingresaron a urgencias de un hospital de cuarto nivel de Bogotá, Colombia, entre septiembre 2016 y febrero 2017. Resultados: se incluyeron 1080 pacientes aleatoriamente con una frecuencia de muerte intrahospitalaria de 10.19% (n: 110), mediana de edad en los fallecidos de 73 años vs 55 años en los no fallecidos. La mediana calculada del puntaje de la escala REMS fue significativamente mayor en el grupo con de muerte intrahospitalaria 7 (5-10) que en los que no fallecieron 3 (0-3). 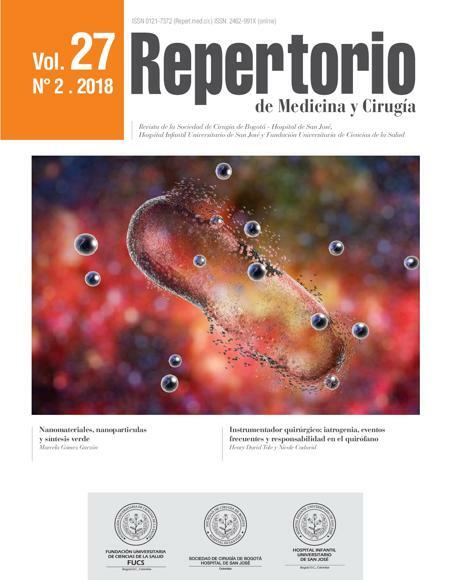 Según el modelo de regresión logística las variables más relacionadas con muerte intrahospitalaria fueron: días de estancia intrahospitalaria (OR: 1.08 IC 95% 1.04-1.12), escala REMS (OR: 1.5 IC 95% 1.34 -1.7), inmunocompromiso (OR: 6.27 IC 95% 2.12-18.5) y patología oncológica (OR 12 IC 95% 6.25-26.6). El punto de corte asociado con mortalidad fue de 6 para la escala, teniendo en cuenta las otras variables que impactaron en la mortalidad se establece un OR de 4.3 (IC 95% 2.3 - 8). El poder discriminativo de la prueba da una AUC de 0.97 considerado bueno. Conclusiones: en nuestra población la escala REMS fue un buen predictor de mortalidad intrahospitalaria en urgencias por condición quirúrgica o no, considerándola como buena herramienta para la toma de decisiones clínicas, derivación y usos de recursos. No es posible establecer esta relación en condición traumática debido al tamaño de la muestra. Teniendo en cuenta el análisis de otras variables es posible establecer una nueva escala en la cual se incluya el REMS y variables asociadas estadísticamente significativas. 1. Jones AE, Fitch MT, Kline JA. Operational performance of validated physiologic scoring systems for predicting in-hospital mortality among critically ill emergency department patients. Crit Care Med. 2005;33(5):974-8. 2. Singer AJ, Thode HC, Viccellio P, Pines JM. The association between length of emergency department boarding and mortality. Acad Emerg Med. 2011;18(12):1324-9. 3. Cattermole GN, Mak SK, Liow CH, Ho MF, Hung KY, Keung KM, et al. Derivation of a prognostic score for identifying critically ill patients in an emergency department resuscitation room. Resuscitation. 2009;80(9):1000-5. 4. Sun Y, Heng BH, Tay SY, Seow E. Predicting hospital admissions at emergency department triage using routine administrative data. Acad Emerg Med. 2011;18(8):844-50. 5. Olsson T, Terent A, Lind L. Charlson Comorbidity Index can add prognostic information to Rapid Emergency Medicine Score as a predictor of long-term mortality. Eur J Emerg Med. 2005;12(5):220-4. 6. Brabrand M, Folkestad L, Clausen NG, Knudsen T, Hallas J. Risk scoring systems for adults admitted to the emergency department: a systematic review. Scand J Trauma Resusc Emerg Med. 2010;18:8. 7. Vincent JL, Moreno R. Clinical review: scoring systems in the critically ill. Crit Care. 2010;14(2):207. 8. Nguyen HB, Rivers EP, Havstad S, Knoblich B, Ressler JA, Muzzin AM, et al. Critical care in the emergency department: A physiologic assessment and outcome evaluation. Acad Emerg Med. 2000;7(12):1354-61. 9. Le Gall JR, Lemeshow S, Saulnier F. A new Simplified Acute Physiology Score (SAPS II) based on a European/North American multicenter study. JAMA. 1993;270(24):2957-63. 10. Lemeshow S, Teres D, Klar J, Avrunin JS, Gehlbach SH, Rapoport J. Mortality Probability Models (MPM II) based on an international cohort of intensive care unit patients. JAMA. 1993;270(20):2478-86. 11. Hyzy RC. ICU scoring and clinical decision making. Chest. 1995;107(6):1482-3. 12. Calle P, Cerro L, Valencia J, Jaimes F. Usefulness of severity scores in patients with suspected infection in the emergency department: a systematic review. J Emerg Med. 2012;42(4):379-91. 13. Kuo SH, Tsai CF, Li CR, Tsai SJ, Chao WN, Chan KS, et al. Rapid Emergency Medicine Score as a main predictor of mortality in Vibrio vulnificus-related patients. Am J Emerg Med. 2013;31(7):1037-41. 14. Macdonald SP, Arendts G, Fatovich DM, Brown SG. Comparison of PIRO, SOFA, and MEDS scores for predicting mortality in emergency department patients with severe sepsis and septic shock. Acad Emerg Med. 2014;21(11):1257-63. 15. Hilderink MJ, Roest AA, Hermans M, Keulemans YC, Stehouwer CD, Stassen PM. Predictive accuracy and feasibility of risk stratification scores for 28-day mortality of patients with sepsis in an emergency department. Eur J Emerg Med. 2015;22(5):331-7. 16. Knaus WA, Zimmerman JE, Wagner DP, Draper EA, Lawrence DE. APACHE-acute physiology and chronic health evaluation: a physiologically based classification system. Crit Care Med. 1981;9(8):591-7. 17. Knaus WA, Draper EA, Wagner DP, Zimmerman JE. APACHE II: a severity of disease classification system. Crit Care Med. 1985;13(10):818-29. 18. Wagner DP, Draper EA. Acute physiology and chronic health evaluation (APACHE II) and Medicare reimbursement. Health Care Financ Rev. 1984;Suppl:91-105. 19. Rhee KJ, Fisher CJ, Willitis NH. The Rapid Acute Physiology Score. Am J Emerg Med. 1987;5(4):278-82. 20. Yu S, Leung S, Heo M, Soto GJ, Shah RT, Gunda S, et al. Comparison of risk prediction scoring systems for ward patients: a retrospective nested case-control study. Crit Care. 2014;18(3):R132. 21. Salluh JI, Soares M. ICU severity of illness scores: APACHE, SAPS and MPM. Curr Opin Crit Care. 2014;20(5):557-65. 22. Moseson EM, Zhuo H, Chu J, Stein JC, Matthay MA, Kangelaris KN, et al. Intensive care unit scoring systems outperform emergency department scoring systems for mortality prediction in critically ill patients: a prospective cohort study. J Intensive Care. 2014;2:40. 23. Sekulic AD, Trpkovic SV, Pavlovic AP, Marinkovic OM, Ilic AN. Scoring Systems in Assessing Survival of Critically Ill ICU Patients. Med Sci Monit. 2015;21:2621-9. 24. Knaus WA, Wagner DP, Draper EA, Zimmerman JE, Bergner M, Bastos PG, et al. The APACHE III prognostic system. Risk prediction of hospital mortality for critically ill hospitalized adults. Chest. 1991;100(6):1619-36. 25. Olsson T, Lind L. Comparison of the rapid emergency medicine score and APACHE II in nonsurgical emergency department patients. Acad Emerg Med. 2003;10(10):1040-8. 26. Olsson T, Terent A, Lind L. Rapid Emergency Medicine score: a new prognostic tool for in-hospital mortality in nonsurgical emergency department patients. J Intern Med. 2004;255(5):579-87. 27. Olsson T, Terent A, Lind L. Rapid Emergency Medicine Score can predict long-term mortality in nonsurgical emergency department patients. Acad Emerg Med. 2004;11(10):1008-13. 28. Howell MD, Donnino MW, Talmor D, Clardy P, Ngo L, Shapiro NI. Performance of severity of illness scoring systems in emergency department patients with infection. Acad Emerg Med. 2007;14(8):709-14. 29. Bulut M, Cebicci H, Sigirli D, Sak A, Durmus O, Top AA, et al. The comparison of modified early warning score with rapid emergency medicine score: a prospective multicentre observational cohort study on medical and surgical patients presenting to emergency department. Emerg Med J. 2014;31(6):476-81. 30. Ji CL, Zhou HR, Peng CH, Yang XL, Zhang Q. [Comparison of value of GRACE, APACHEII and REMS for early prognosis of death in patients with acute myocardial infarction]. Zhonghua Wei Zhong Bing Ji Jiu Yi Xue. 2013;25(11):660-3. 31. Polita JR, Gomez J, Friedman G, Ribeiro SP. Comparison of APACHE II and three abbreviated APACHE II scores for predicting outcome among emergency trauma patients. Rev Assoc Med Bras (1992). 2014;60(4):381-6. 32. Imhoff BF, Thompson NJ, Hastings MA, Nazir N, Moncure M, Cannon CM. Rapid Emergency Medicine Score (REMS) in the trauma population: a retrospective study. BMJ Open. 2014;4(5):e004738. 33. Nakhjavan-Shahraki B, Baikpour M, Yousefifard M, Nikseresht ZS, Abiri S, Mirzay Razaz J, et al. Rapid Acute Physiology Score versus Rapid Emergency Medicine Score in Trauma Outcome Prediction; a Comparative Study. Emerg (Tehran). 2017;5(1):e30. 34. Miller RT, Nazir N, McDonald T, Cannon CM. The modified rapid emergency medicine score: A novel trauma triage tool to predict in-hospital mortality. Injury. 2017;48(9):1870-7. 35. Ma QB, Fu YW, Feng L, Zhai QR, Liang Y, Wu M, et al. Performance of Simplified Acute Physiology Score 3 In Predicting Hospital Mortality In Emergency Intensive Care Unit. Chin Med J (Engl). 2017;130(13):1544-51. 36. Alter SM, Infinger A, Swanson D, Studnek JR. Evaluating clinical care in the prehospital setting: Is Rapid Emergency Medicine Score the missing metric of EMS? The American journal of emergency medicine. 2017;35(2):218-21. 37. Aacharya RP, Gastmans C, Denier Y. Emergency department triage: an ethical analysis. BMC Emerg Med. 2011;11:16. 38. Christ M, Grossmann F, Winter D, Bingisser R, Platz E. Modern triage in the emergency department. Dtsch Arztebl Int. 2010;107(50):892-8. 39. Resolución 5596. Por la cual se definen los criterios técnicos para el Sistema de Selección y Clasificación de pacientes en los servicios de urgencias "Triage" Diario Oficial No. 49.739 (2015). 40. Goodacre S, Turner J, Nicholl J. Prediction of mortality among emergency medical admissions. Emerg Med J. 2006;23(5):372-5.